This refreshing salad is perfect for summer with its crisp cucumber, juicy watermelon, and salty feta. Watermelon contains 92% water and acts as a natural energy booster, so you'll stay hydrated and energized. Whisk together lime juice, honey, mint, and oil until honey is dissolved; set aside. Combine watermelon, honeydew, cantaloupe, and onion in a large bowl. Toss melon mixture with lime dressing until coated. Season salad with salt and pepper to taste. Who needs meat when you have a recipe this good! 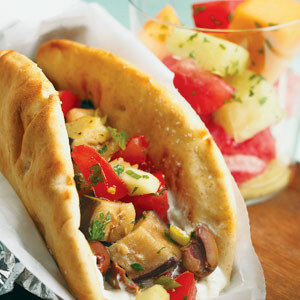 Everyday ingredients and the right spices make a great gyro.